Welcome to our new tutorial series on learning Maxon’s Cinema 4D Lite, which is included in the Adobe After Effects Creative Cloud application. In this series, we’re going to get you up and running with not only the basics of Cinema 4D Lite, but also how it interacts with After Effects. It’s important to keep in mind that C4D Lite is not a plugin, but a completely separate application that you will use in conjunction with After Effects. Let’s get started. It’s important to first keep in mind that C4D Lite is installed on your computer, at the same that that you installed Adobe’s After Effects CC 2015. 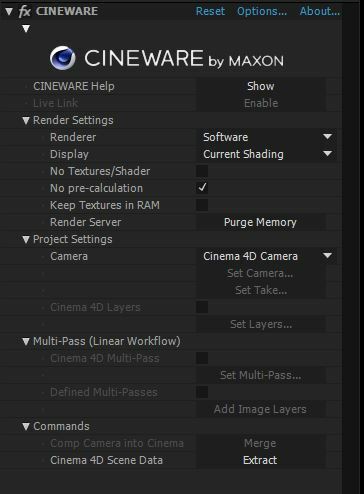 The way that C4D Lite works with After Effects is via the Cineware Plugin. Once you’ve created a new C4D project/element, and dropped it into a composition, After Effects immediately adds the Cineware plug-in to your clip. That way, After Effects can understand and then display the 3D model (whether it’s an actual model or an element like text doesn’t matter) in your composition. Now that does of course beg the question, how do you go about creating a C4D element to add to a composition that you’re working on? We’ll talk about that, coming up, in our next lesson!